Often associated with beauty, rose gold is a delicate and pretty metal choice, perfect for those who want something a little unique while still keeping their engagement ring design contemporary and feminine. In fact, behind platinum, rose gold is the most popular metal choice amongst our customers. 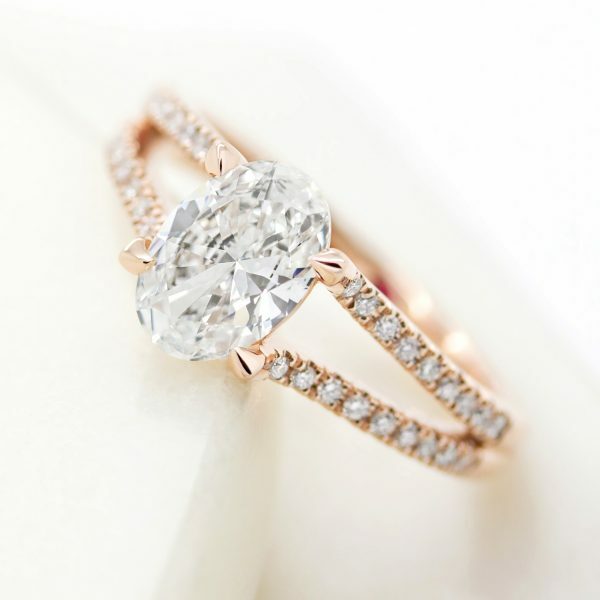 Rose gold engagement rings consist of a mixture of gold and other metals, that give rose gold its blushy, soft hue. 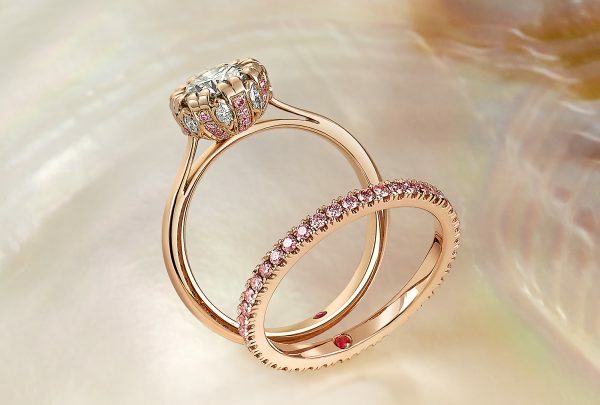 Rose gold is also sometimes referred to as red or pink gold. What is rose gold made from? Many people don’t know that pure 24 carat gold is too soft to be used to craft everyday jewellery, so other alloys like silver, palladium, copper nickel, and zinc are added to it. 18ct rose gold is typically a mixture of gold, copper and silver, to achieve greater durability and its desired soft rosy colour. The more copper, the deeper the rose hue. The more silver, the paler the pink colour. Why should I choose a rose gold ring? Fast becoming a modern-day trend, rose gold offers a contemporary aesthetic to an otherwise traditional item of jewellery. Its delicate yet strikingly modern appearance is responsible for its rising popularity. Rose gold has also always been considered a flattering metal choice for all skin tones, emitting a warm and romantic glow both day and night. Often associated with beauty, rose gold is a delicate and pretty metal choice, perfect for those who want something a little unique while still keeping their engagement ring design contemporary and feminine. In fact, behind platinum, rose gold is the second most popular metal choice amongst our customers. It’s a versatile metal and can be worn with existing yellow and white gold jewellery or set with colourful gemstones and traditional white diamonds alike, to give a dynamic style. It stands out without being brash; it blends without being invisible, making rose gold a truly spectacular visual experience, one that never ages. Rose gold has a long history of popularity among society’s elite. Despite the current-day popularity of rose gold, blending copper and gold isn’t new. In fact, rose gold appeared as early as the nineteenth century when popular jeweller to the Russian Tzars, Peter Carl Fabergé, incorporated the metal into his most ornate creations and, more commonly, into his popular Fabergé eggs. The early 1900s saw excess, both socially and artistically. Jewellery design reflected the opulence of the time, with the use of vivid colours and warmth. However, rose gold engagement rings as a trend didn’t peak until the 1920s with the Cartier Trinity Band. This burst of popularity lasted until the Art Deco movement brought white metal jewellery back into the mainstream, making white gold and platinum engagement rings the most popular choice of the era. But when platinum was banned and prohibited due to the Second World War efforts, rose gold engagement rings once again resurfaced and gradually became more popular. One thing that will prevail with today’s rose gold engagement rings and jewellery is the same thing that has stood the test of time with designs from the nineteenth-century Faberge-era and the twenties’: timeless appeal. 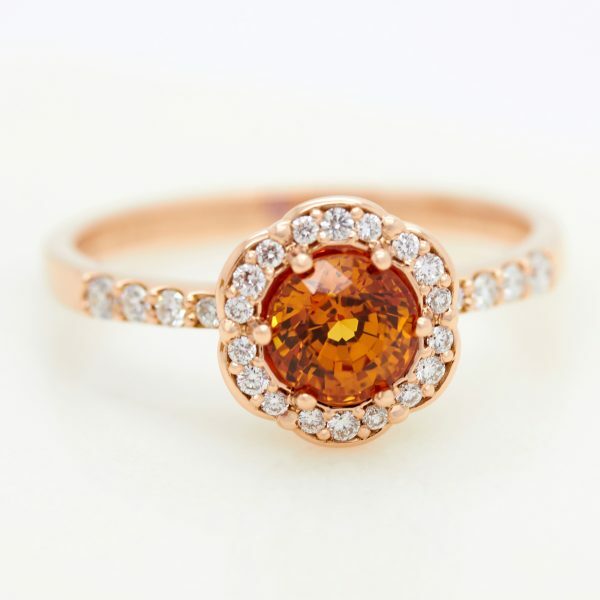 Some people credit the insatiable popularity of rose gold engagement rings to tech and fashion companies that have featured rose gold tones and metallics in recent collections over the past decade. 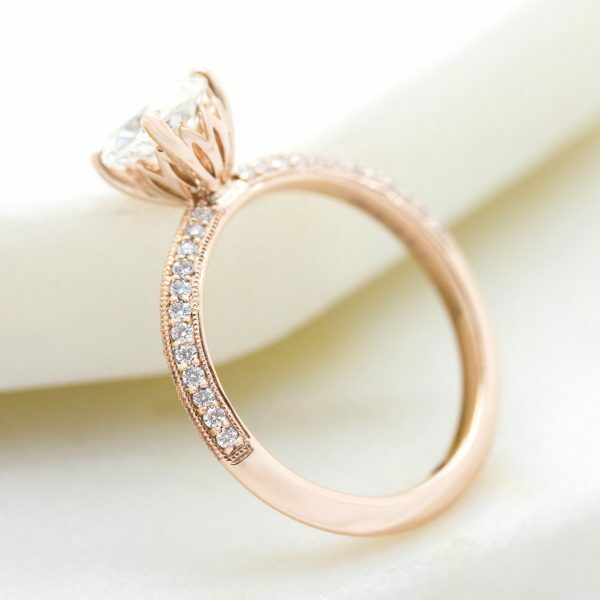 Rose gold engagement rings offer the perfect combination of romantic traditionalism and on-trend modernism. An incredibly on-trend metal, rose gold offers a level of subtle experimentation with colour, perfect for all complexions. Which celebrities wear rose gold engagement rings? With the type of exclusivity that comes with rose gold jewellery, Hollywood celebrities have targeted the metallic hue en masse. Gossip Girl stars, Blake Lively and Leighton Meester both own rose gold engagement rings. The trend makes for a pretty, yet modern metal choice, increasingly in demand. Other stars like Julianne Hough, Alison Brie and Lauren Conrad can also be seen embracing this popular metal trend.